Fish Tacos with Avocado Cream - Bake.Eat.Repeat. 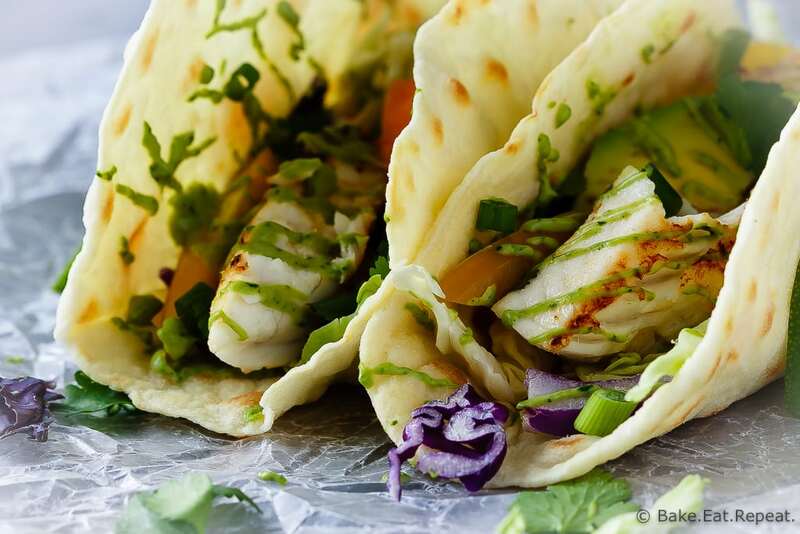 A perfect 20 minute meal when you want something healthy that everyone will love – these fish tacos with avocado cream are fantastic! We probably eat tacos at least weekly around here – everyone loves them. But I haven’t made fish tacos more than once or twice over the years. The kids never used to like seafood so we would typically stick with chicken or beef for taco night. That has been changing though – my eight year old has now started saying that fish and shrimp are one of his favourite things! In fact, after serving it on a regular basis for a couple years, all three of them will now eat fish quite happily. 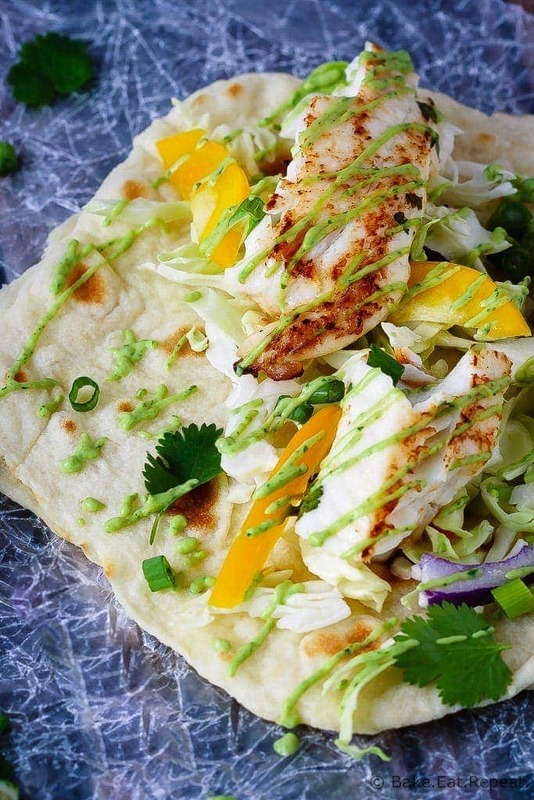 Of course, they still eat it pretty plain (we’re talking fish tacos that involve a tortilla, a piece of fish and a few strips of bell pepper – no sauce! ), but that’s okay. The beauty of tacos – everyone can have them the way they want! It’s actually starting to get a little tough to cook enough fish. I always think that I’m making truckloads of food and then all the fish is gone and people are still hungry. How is that even possible already? My oldest is only 10. Isn’t the ravenous, eat you out of house and home behaviour supposed to start much later? Like 4 or 5 years from now at least? Evidently we will literally have no food in the house ever when my boys are teenagers. I’m a bit frightened. That is one of the things I love about having fish tacos instead of fish by itself. The tortillas and all the toppings really help stretch the meal so that I can cook a reasonable amount of fish and everyone still gets enough to eat. Plus you can load up your tacos with veggies and have quite a healthy meal. Which I don’t always feel is the case when it comes to tacos – by the time you load on the cheese and salsa and sour cream, it doesn’t really seem all that healthy anymore! But fish tacos? Pretty healthy stuff. Grilled fish, veggies, an avocado cream sauce that I kind of want to slather on everything it’s so good, all wrapped up in a warm tortilla shell. That, my friends, is a perfect meal. At least in my world. Note: Recipe and post updated April 4/16, originally posted July 14/14. 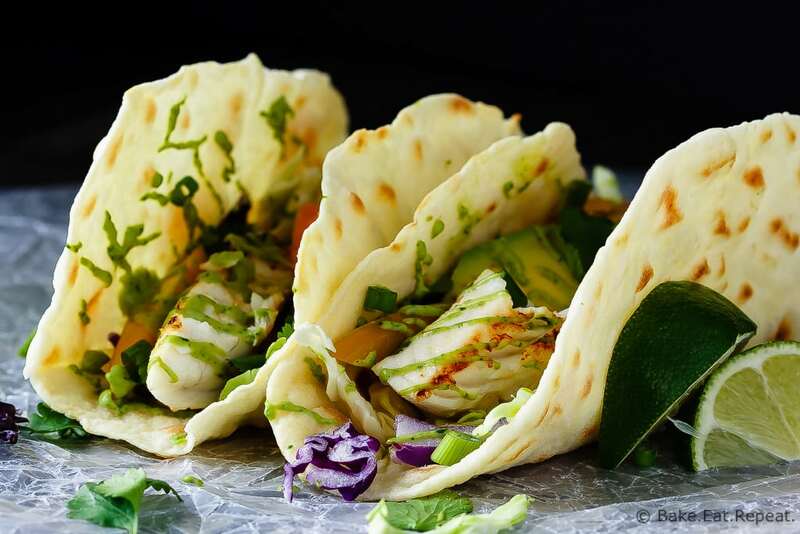 A perfect 20 minute meal when you want something healthy that everyone will love - these fish tacos with avocado cream are fantastic! Preheat the grill to medium high heat. In a shallow dish, whisk together the olive oil, lime juice, hot sauce, jalapeno, cilantro and kosher salt. Add the fish and turn to coat. Marinate in the refrigerator for 10 minutes before grilling. When ready to grill, cook for 4-5 minutes on each side or until the fish flakes easily with a fork. Prepare the taco fillings and set aside. For the avocado cream sauce, blend together the sour cream, avocado, cilantro, green onion, lime juice and kosher salt until well combined. Refrigerate until ready to eat. To serve, flake apart the fish and use several pieces per tortilla. Garnish with the toppings as you like and enjoy! I seeded the jalapeno in the marinade as my kids won’t eat anything too spicy, so I didn’t want to chance it! You definitely don’t need to seed it if the heat is not a concern. You can also use a non-stick skillet on the stovetop over medium heat to cook the fish if you like, it will still be 4-5 minutes per side or until the fish flakes easily. If you’re not a cilantro fan, you can also make the avocado cream sauce without the cilantro - it’s still fantastic! Source: Adapted from Kitchen Confidante . This is the first time I've commented but felt compelled to tell you that the avocado cream sauce is the best ever! And so easy. My husband and I like spicy so I added a chopped fresh jalapeño. Delicious. Just had it on a grilled shrimp taco with romaine. YUM! Thank you for sharing. Thanks Lisa! I love that avocado cream sauce too - it might just be the best part of those tacos, and that's from someone that could eat fish everyday I love it so much! :) Definitely need to try your grilled shrimp version, that sounds fantastic! This sounds like an excellent version of fish tacos. I live in Mexico, in the port city of La Paz. And dine on fish tacos weekly. The favored tortilla is now Masa (corn), rather than Harina (flour). And if available, use the small size special taco tortillas. Heat the tortilla in a dry flat pan before assembling the taco, it just tastes better this way. Also the avocado crème has fallen in popularity with fish tacos. The replacement is to reconstitute dried Chipotle chilies, which are smoked jalapeños, and blend a little into the crema. A great substitute is to open a small can of Chipotle in Adobo sauce and add a couple of tablespoons of the infused adobo. You can freeze the rest of the can until next time. And finally, add Pico de Gallo as an option. I am a geeat fan of preparing my fish "plancha" which is fried with a tiny bit of oil but without any breading. I'm also a fan of Dorado or Mahi. This is our second time making the fish tacos, love them, I did use Mahi Mahi as that is a fish I can eat and it's white and firm. The marinade was really good even though I did not put quite as much hot stuff as you suggested as dad isn't too crazy about hot. We both loved this recipe. Will make it again! We love fish tacos! That avocado cream sounds so good!